There is some confusion over the spelling of Frank Merrett’s surname. 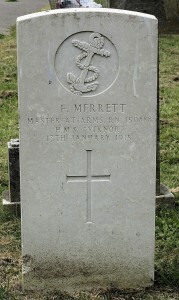 Some naval documents spell it ‘Merritt’ as on Rogate War Memorial, but most census documents and his Birth Certificate spell it as Merrett. It was also difficult to establish a connection between Frank and Rogate, but it is apparent that his parents moved to Dumpford Lane, Rogate in the 1890s and later to Habin. His parents are buried in Terwick Churchyard. Frank Merrett was born in Hambledon, Hampshire on 20 April 1871 [although his Navy Records record his birth year as 1873]. He was the second son of six children of William Merrett, who was born in Limerick, Ireland, a Postman, and his wife Susan. Frank married Charlotte Alice White on 25 December 1897 in St.Bartholomew’s Church, Rogate and a son Frank Turner Merrett was born to the couple on 19 February 1899 in Cowes on the Isle of Wight. Frank Turner was christened in St Bartholomew’s on 2 April. By 1891 Frank had joined the Royal Navy and was a member of the crew of HMS Research, a 4th Class Surveying ship which at the time was lying in the Repairing Basin in Portsmouth Dockyard. In 1901 he was a Petty Officer serving in HMS Vulcan, a Torpedo Depot ship lying in Grand Harbour, Malta. Frank had been promoted by 2 April 1911 when he was a Ship’s Corporal 1st Class on HMS Prince of Wales, a First Class Battleship of the Atlantic Fleet which was lying in Gibralter. On 13 January 1915 Frank was Master at Arms on HMS Viknor, a ship which before the war was SS Atrato and which was requisitioned by the Admiralty, equipped with armament and renamed. She was mainly used as a cruising patrol ship and was part of the 10th Cruiser Squadron. While on patrol on 13 January some eleven miles West of Tory Island Co. Donegal, Ireland and in heavy weather she sank without any distress call. It was assumed that she was either sunk by a mine or foundered in the heavy weather. None of the 295 crew was saved. Many bodies were washed ashore on the coasts of Ireland and Scotland in the days following the sinking. These bodies were buried close to where they were found. However, Frank’s body was picked up by a fisherman in Gigha Harbour, County Argyll on 2 February and was sent to Portsmouth. He was buried in Kingston Cemetery, Portsmouth on 9 February 1915. He is also commemorated on the Rogate War Memorial.